이 교서는 인조 3년(1625)에 이중로에게 추증한 것으로 그가 죽은 뒤에 내린 것이다. 이중로(1577∼1624)는 개국공신 이지란의 후손으로 이괄의 난 때 이성부와 함께 예성강 상류인 마탄에서 전사하였다. 16살 되던 해에 무과에 급제하였으며, 이듬해 선전관이 되었고, 광해군 13년(1621)에는 이천부사가 되었다. 인조 1년(1623)에 인조반정에 참가하여 정사공신 2등에 임명되어 청흥군으로 봉해졌다. 교서에는 이중로의 초상을 그려 후세에 길이 남기고 관직을 2계급 올려주었고, 또한 부모, 처자에게도 마찬가지로 2계급 올려주었으며, 큰아들에게는 이중로가 누리던 벼슬의 지위를 영원히 세습할 수 있다는 내용 등이 담겨있다. 그리고 관에서 일하는 노비와 공신에게 내리는 노비 등을 합쳐 19명의 노비, 밭 80결, 은 30량, 옷감 1단, 말 1필 등을 내리도록 지시하고 있다. 이 교서는 인조반정에 참여한 공신에 대한 포상의 내역을 알 수 있는 귀중한 자료이다. ※ 2004년 5월 7일 보물 제1174호 청흥군이중로정사공신교서에서 보물 제1174-1호 이중로정사공신교서로 지정번호 및 명칭 변경됨. This royal certificate was issued posthumously to a civil official named Yi Jung-ro in the 3rd year of the reign of King Injo (1625) of the Joseon Dynasty. Yi Jung-ro (1577-1624) was a descendant of Yi Ji-ran who played an important role in the founding of the Joseon Dynasty. Together with Yi Seong-bu, he died in battle in Matan near the upper stream of Yeseonggang River during the insurrection of Yi Gwal. He passed the military service national examination at the age of 16 and got appointed Seonjeongwan (military staff guard) and later Magistrate of Icheon in the 13th year of King Gwanghaegun’s reign (1621). In the 1st year of King Injo’s reign (1623), he participated in a coup to overthrow King Gwanghaegun in favor of his nephew, who later became King Injo. He was enrolled as a second-rank meritorious subject and honored with the title Cheongheunggun in recognition of his role in the successful coup. 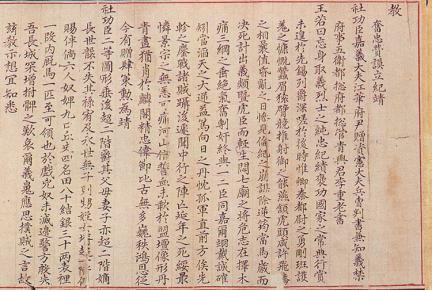 The royal certificate ordered drawing a portrait of Yi Jung-ro for his descendants to commemorate him and to promote his parents, wife, and children and him by two ranks from his official post and to allow his first son to succeed his government position in perpetuity. It also instructed the offering of 19 servants, 80 gyeol (measure of land used in the Joseon Dynasty) of farming land, 30 silver coins, 1 roll of fabric, and 1 horse. This certificate provides important information as to the details of reward offered to contributors who figured in the coup. ※ On May 7, 2004, the designation number and name were changed from Treasure No. 1174. 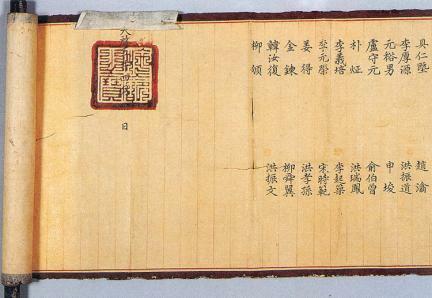 Royal Certificate of Meritorious Subject Issued to Cheongheunggun Yi Jung-ro to Treasure No. 1174-1. 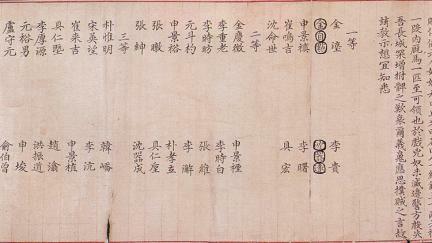 Royal Certificate of Meritorious Subject Issued to Yi Jung-ro.